Are you a night owl and your spouse is an early bird? Or, perhaps, are you the early bird and your significant other falls asleep as the sun is rising? Many couples face the struggle of going to bed and waking at different times. In some cases, bed partners' agendas only differ by minutes. In more extreme situations, couples' waking and sleeping patterns may be completely flip-flopped. Roughly 70% of adults living in the United States report that they share a bed with another person. Of that 70%, about 25% rise early while another 25% tend to sleep in. (The other 50% fall somewhere in between.) As these statistics show, a large number of individuals who bed share experience differences in sleep routines. Dissimilar sleep patterns unfortunately have the potential of harming both the relationship and the sleep quality of bed partners. According to an article released by Psychology Today, couples who don't get sufficient sleep at night leads to less satisfied relationships. Evidence shows that spouses who sleep heartily tend to be happier and apply more positive feelings to their close relationships. Additionally, individuals who don't get enough sleep display more negative emotions and have more conflicts with their spouses. Those who engage in sleep-deprived conflict are more apt to revert to aggressive behavior. Furthermore, Prevention reported that studies conducted by the University of California showed that sleep deprivation reduced feelings of gratitude. Participants in the study answered questions regarding how much gratitude was felt in their personal relationships including whether or not they noticed thoughtful acts committed by their spouse. Combined with information about their sleep habits, psychologists discovered that those who achieved more sleep were more thankful. Therefore, what should couples do when they realize that their lifestyles, jobs, or circadian rhythms prevent them from sleeping at the same time as their spouses? Should they simply throw up their hands and accept the fact that their relationships will be more problematic than others whose sleep patterns are the same? No. In fact, there are many ways that sleep partners can learn to adjust to one another's sleep schedules so that both individuals can maintain a healthy relationship and achieve a full night's rest. Heather Gunn, a psychologist and a couples sleep researcher at the University of Pittsburgh who advises patients in a sleep clinic, reported in the New York Times that the most important thing that she has learned in her studies is that couples don't necessarily need to have the same exact sleep schedules in order to have healthy relationships. Gunn noted, "There's even some evidence that well-adjusted couples who have mismatched sleep schedules are actually much better at problem solving." According to her research and experience, Gunn suggests that couples who sleep differently budget in time during the day to connect with their partner. Be it over breakfast in the morning, a half hour before one of the partners goes to sleep, or making time to associate during the weekends, diligently planning time spent together is important. Be considerate. If life circumstances prohibits individuals from sleeping at the same time, the partner who is awake should be aware of their noise and activity level if the other is trying to get some shut-eye. Making sure the volume on the television is low, stepping quietly when walking through the house, and leaving lights off in the bedroom are all courteous things that awake partners can do to be considerate of the other person. Don't try and change the other person. Many individuals in this early bird versus night owl scenario insist that their circadian rhythm is the "correct" one. However, due to numerous factors including biology, people operate on all kinds of different sleep schedules. No one sleep schedule is right or wrong. Therefore, approaching each other's spouses with understanding is the only way to go about solving sleep pattern problems. Focus on the positives and make time for each other. Instead of dwelling on the negative aspects of sleeping at different times, individuals should focus on cherishing their alone time and making the most of the time that they have with their partner. As Gunn noted as a result of her sleep studies, working on conflict resolution and being conscious of carving out time for one another actually has the potential to improve and strengthen relationships. Although differences in sleep schedules are oftentimes a lifestyle result, there are instances when bed partners suffer a lack of sleep due to more serious problems. Individuals who aren't getting sufficient sleep due to a sleep disorder won't be able to solve their problems on their own. Many people with undiagnosed sleep disorders tend to suffer more in relationships with their bed partners because, no matter the arrangements, both individuals suffer a poor night's sleep if one is tossing, turning, and snoring. Specifically, those with undiagnosed obstructive sleep apnea have coined the condition "a disease of listeners" because it affects bed partners as much as it does the sleep apnea sufferer. Both obstructive sleep apnea and insomnia are the two leading sleep disorders that plague adults today. 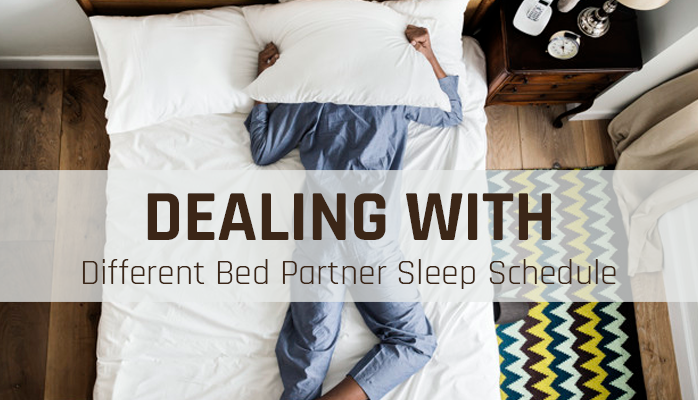 If either bed partner believes that a sleep disorder might be leading to differences in sleep patterns, it is critical that the individual seeks professional help immediately. Sleep specialists at the Anchorage Sleep Center who can address sleep problems and thus improve sleep quality for both bed partners are able and ready to help diagnose a potential sleep disorder. By scheduling a consultation, you can begin your journey to a better night's rest and a healthier relationship. Learn more about sleep disorders, sleep solutions, and what we can do to help at ancsleep.com.